DynoSeal Driveway/Asphalt Sealer is a low odor elastomeric sealer and topcoating for asphalt surfaces. It helps to reduce the offgassing and offensive smells generated by new asphalt, while preserving and renewing existing asphalt surfaces. 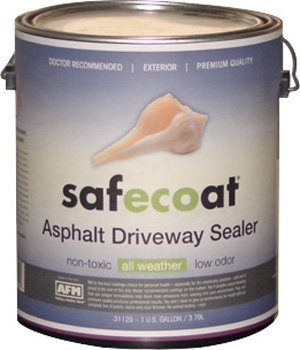 Safecoat Asphalt Driveway Sealer can be used on unsealed or previously sealed asphalt surfaces. It can also be mixed with sand to make an asphalt driveway patch for small areas. One gallon of Safecoat Asphalt Driveway sealer covers approximately 100-600 square feet per gallon depending on dilution and surface condition (porosity). Coating that has been mixed 1:1 with sand wil normally coat about 15-50 square feet per gallon. Apply with brush, roller, broom or squeegee. Apply in thin, even coats and avoid laps or puddling. Use on dry surfaces and avoid applying over hot surfaces. Do not apply when there is a threat of rain, if rain is imminent within 72 hours of final topcoat, or on humid days. Allow at least 24-36 hours of curing before allowing heavy traffic to travel on newly coated surface. Sand can be added to coating to give greater fill characteristics on badly weather asphalt. San can also be sprinkled on surface to help eliminate tackiness if too much coating has been applied.